Last fall, when I kicked off my search for a new bike, it was clear what I wanted: something just like my old bike, but better. The “Plastic Bullet”—a 2006 Specialized Roubaix Expert—had served me very well over the years, and I had nothing to complain about, save that it was showing the signs of age. Because of that, the new version of the Roubaix was at the top of my list when I started thinking about a new bike. However, a lot has changed since 2006. There are a lot more bikes out there, and I didn’t want to stick with the Roubaix if there was something better to be had. So I decided to shop around and ride a bunch of bikes, exploring new technologies like disc brakes, electronic shifting, SRAM shifters, and so forth. I tried everything out and enjoyed the process. I test-rode eight bikes, with a collective price tag of $32,300. I learned that I hate disc brakes, SRAM shifters, FSA components, integrated seatposts, and pretty much all bikes manufactured by Trek. On the other hand, I really liked Shimano’s electronic shifting, the Cervelo R5, and Giant Defy Advanced. 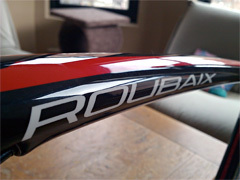 But above all, I learned that the Roubaix still seems to be the best all-around bike for me. It fits me and my style of riding well, does a great job absorbing road vibration, and strikes a good balance between ride-all-day comfort and ride-all-out performance. To make a final decision, I had my LBS bring in a Roubaix that was nearly identical to the one I was looking at. After test riding it, I went home pretty well convinced that I’d be buying the exact same damned bike I bought back in 2006: a Specialized Roubaix Expert. I’d still have to special-order it though, because dealers simply don’t stock bikes my size. An hour after that test ride, I received an email from the shop, indicating that the following week Specialized would be offering a manufacturer’s discount on that bike: a 20 percent price cut, or a $1,000 savings! Needless to say, I jumped at that. A long two weeks later, I took delivery. So how is the new bike different from the Plastic Bullet? Aside from being newer, there are really only two significant ways. One is the Shimano Di2 electronic shifting. I’m pretty excited about that, but I don’t need to say too much about it here, having already written about it in one of my test ride roundups back in September. The other is that while both bikes are primarily clear-coat over carbon fiber, the new bike has red and white highlights (ironically, those are my high school colors), rather than blue and silver. So the blue tires are gone, and I’ll have some extra work coordinating accessories to match the new color scheme! Which brings me to the real question: what to name it! This is also a little two-part story. First, it’s my second Roubaix. To honor that, let’s call it Roubaix-2, or just “R2”. Second, its most interesting feature is the electronic shifting: Shimano’s “Digital Integrated Intelligence” or Di2. Put those together and you get the new bike’s moniker. Allow me to introduce you to R2-Di2! The reference to the iconic Star Wars robot is intentional, and appropriate for a bike with electronic shifting. It even makes cool robot noises as the servos shift the derailleurs to change gears! Having only received it Tuesday, I haven’t got much to say about its riding characteristics just yet. I’ve still got to get it properly fitted and add a bunch of accessories to it before I share any pictures. So it’ll be a few weeks before I have a lot to share, but be patient; those’ll all come in due time. Of course, saying hello to R2 means saying goodbye to “R1”: the Plastic Bullet. After seven years and 22,000 miles—including seven Pan-Pass Challenges and dozens of century rides—we’ve unrolled an awful lot of road together. It’ll still see the tarmac from time to time—on rainy days or city errands where I don’t want to break out the new bike. But as of today, she’s second saddle. It’s time to start making a new history of travel adventures with the R2. Stay tuned!